Located in Weiyuan Town, the seat of the Tu Autonomous County of Huzhu, 30 kilometers from Xining, the Tu Village has more than 100 families with over 500 inhabitants. The villagers speak their own language, and have their own tradition and culture. They are talented singers and dancers. 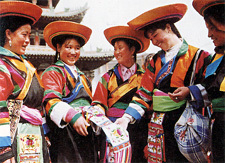 The Tu women are good as embroidery, and their clothes are joined together with pieces of cloth in blue, black, yellow, white, and red, embodying the sky, the earth, harvest, good luck, and enthusiasm. Hence, the county is known as Home of the Rainbow.